At 5:05 a.m. EST (1005 UTC) on Feb. 8 the MODIS instrument that flies aboard NASA's Aqua satellite gathered infrared data on Tropical Cyclone Gelena. Infrared data provides temperature information. MODIS found coldest cloud top temperatures as cold as minus 80 degrees Fahrenheit (minus 62 Celsius) in storms in the northwestern quadrant, outside of the eye. NASA research has shown that cloud tops with temperatures that cold were high in the troposphere and have the ability to generate heavy rain. 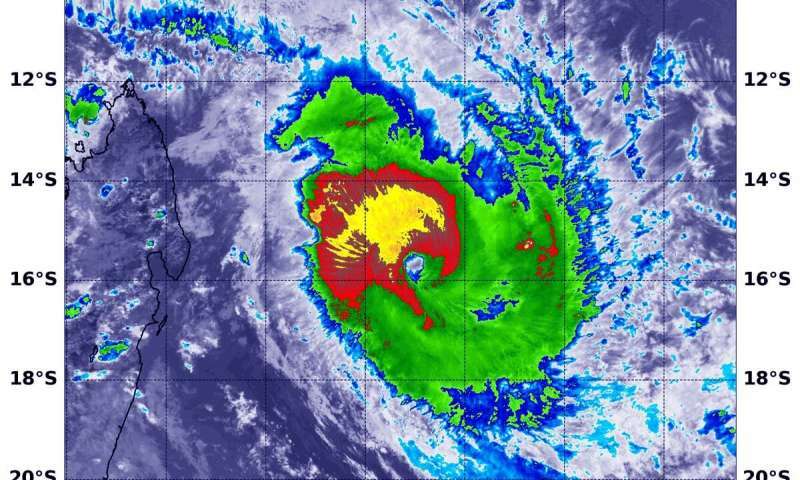 At 10 a.m. EDT (1500 UTC), the center of Tropical Cyclone Gelena was located near latitude 15.7 degrees south and longitude 55.3 degrees east. That's about 288 nautical miles north-northwest of Port Louis, Mauritius. Maximum sustained winds were near 105 knots (121 mph/194.5 kph) and strengthening.